Thanks for a great 2018 turkey season. Check back in October 2019! We raise our turkeys outdoors in the clean mountain air of Plainfield, Vermont. Started from day old-chicks, our birds are raised on pasture, rotated twice per week, and do receive grain. 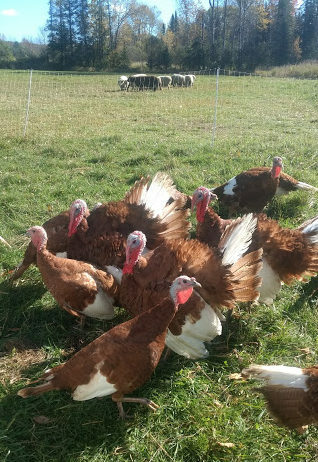 We raise heritage breed Bourbon Red turkeys, which finish between 9-16 lbs and are $10 per pound, and standard breed Bronze turkeys, which finish between 12 -22 lbs and are $5.50 per pound. To reserve a turkey you must make a $20 deposit; this will be taken off the final price you pay at pickup. We do our absolute best to match your turkey size request, but due to the nature of pastured poultry, we may be a pound or two off. If you are unhappy with the size bird provided at pickup we will refund your deposit. All birds will be fresh (not frozen) and available for pickup at Union Square Greenmarket on Saturday, November 23 and Wednesday, November 27 (the day before Thanksgiving). Birds can be frozen upon request. For example- if you want a bird for the holidays or New Years, now is the time to reserve it. All birds must be picked up by 3 pm on Wednesday, unless you make a prior arrangement with us. For pickup, please know the name and email of the person who made the reservation via Paypal. We will not release the bird if you cannot confirm the name and email. A large selection of organic vegetables will be available for purchase as well. Please make your reservation using paypal below. If this page is live, then we still have turkeys. You will receive an email confirming your order.